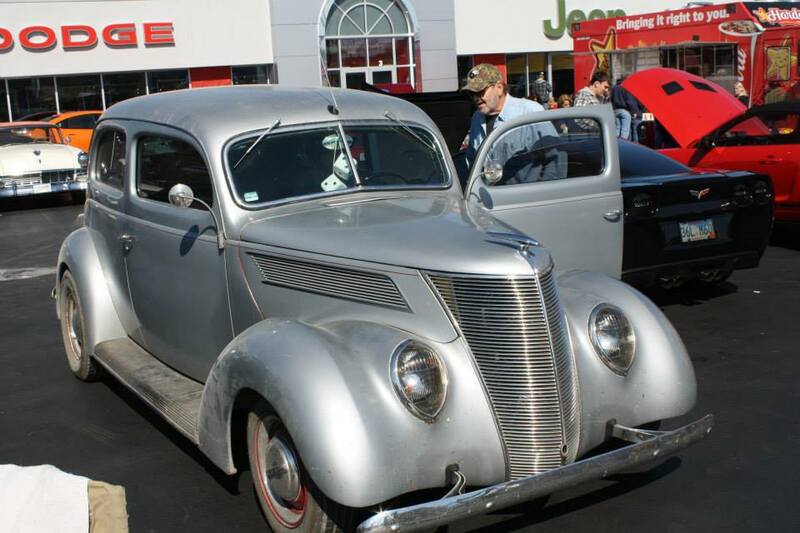 Ken Arrowsmith caught the ’37 Sedan at a local car show, in Sullivan, MO. I was buzzing through Ken Arrowsmith’s photos, from a car show this past weekend, and happened to spot my old ’37 Ford Sedan. It was kind of like seeing a picture of an old friend! From the looks of it, about the only thing that Jim has done to the car is add some hinge mirrors and fuzzy dice. It still has the windshield, with a crack in the upper driver side corner and the home made “StreetRodder Network” sticker at the bottom passenger side. It also looks like Jim’s added a whole lot more road dirt to the finish! Thanks, Ken, for letting me borrow your photo! It was really cool to see the old car out and about!